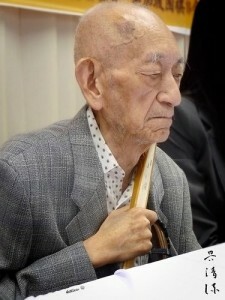 This week living go legend, Go Seigen, turns 97. As many readers will know, Go is famous for his brilliant record in the newspaper sponsored jubango (ten game matches) of the 1930s-50s and his involvement in the Shin Fuseki (new opening) movement of the 1930s. According the Gregorian calendar, Go’s birthday was on June 12. However, if you missed it, his birthday according to the Chinese (lunar) calendar is on June 20 this year, so there is still an opportunity for those who wish to celebrate it. In other news, Kong Jie 9P won the 23rd Asian TV Cup for the third year in a row. Kong defeated Yamada Kimio 9P of Japan and Baek Hongseok 8P of Korea to defend the Cup for China. A full report is available at Go Game Guru. The 16th LG Cup has started in Seoul, Korea – with the first round being completed on June 13. Some notable results from this round include Park Younghun 9P defeating Lee Sedol 9P, Lee Changho 9P knocking out Gu Li 9P and Park Jungsang 9P eliminating Kong Jie 9P. This promises to be an exciting tournament, with the most anticipated game of round two being Lee Changho’s meeting with Iyama Yuta 9P of Japan. You can keep track of all the results and see the game records at Igokisen. Photo: Go Seigen at the 6th Ing Cup in 2009, by Ho at Falling Stones.